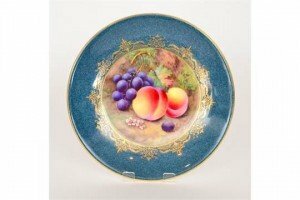 A Royal Worcester fruit painted cabinet plate decorated by Lockyer with hand painted peaches and red grapes, the border edge in blue with gilt detailing, puce mark with date code for 1934. 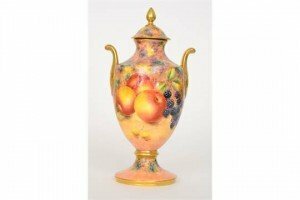 A contemporary twin handled vase and cover decorated by former Royal Worcester artist Gerald Delaney with hand painted apples and blackberries to one side and pears and grapes to the other. 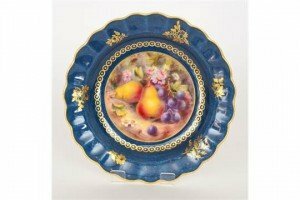 A Royal Worcester fruit painted shallow plate decorated to the central roundel by Martin with pears, red grapes and daisies, the border edge in blue with gilt detailing, signed, blue printed mark with date code for 1913. 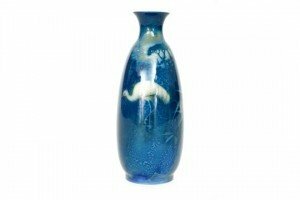 A Royal Worcester Sabrina Ware vase of high shouldered form, decorated with a stork wading through grass, initialled AS for Albert Shuck. 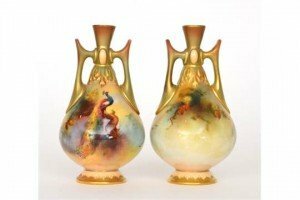 A pair of Royal Worcester Hadleys twin handled vases, decorated by F.J Bray with hand painted peacocks sat upon pine cone branches, signed, both with green marks and date codes for 1911. 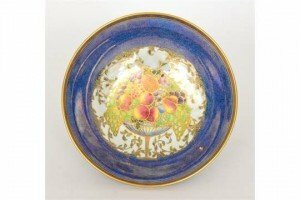 A 1920s Royal Worcester Crown Ware footed bowl, the central roundel with an overflowing basket of fruit and berries, all to a wide brimmed blue sponged border with a gilt border edge, gold mark with date code for 1926. 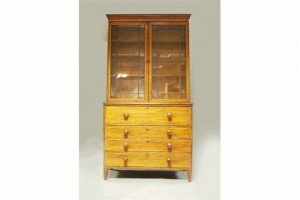 An Edwardian mahogany and line inlaid bureau bookcase, the broken swan neck pediment above a pair of astragal glazed doors enclosing two adjustable shelves above fall front, enclosing fitted interior and three long graduated drawers raised on square tapering supports. 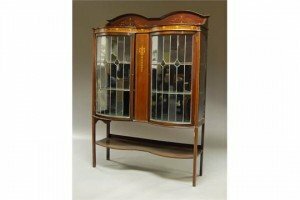 An Edwardian mahogany display cabinet with a twin arched top, raised above a pair of bowed glass doors above an under tier and raised on a square support. 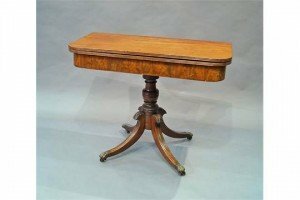 A 19th century mahogany twin flap tea table, on a turned vase form pedestal, supported on four spreading foliate terminal reeded legs, terminating in castors. 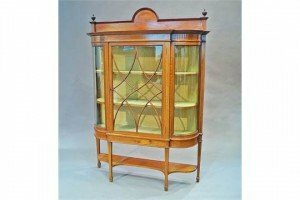 An Edwardian mahogany satinwood banded display cabinet, with arched and finial top, above glazed door with rounded glazed sides, enclosing shelves, on square tapering legs terminating in spade feet, joined by stretchers. 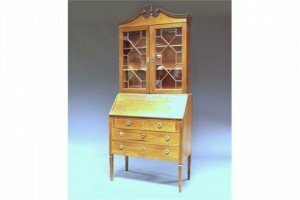 A 19th century mahogany and satinwood cross banded secretaire bookcase, the moulded cornice above pair of glazed doors enclosing three adjustable shelves, the base section with secretaire drawer enclosing fitted interior above three graduated drawers raised on square tapering feet. 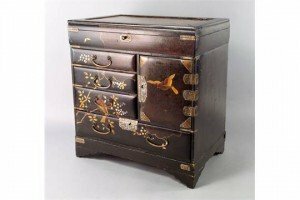 A Japanese export lacquer cabinet, late 19th/early 20th century, the top with lifting lid containing compartments, above three drawers and cupboard concealing two drawers, above a long drawer, on bracket feet, overall inlaid with mother of pearl and painted with trees and birds. 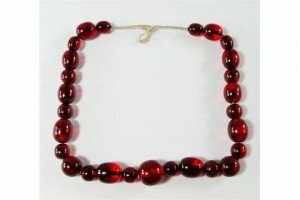 A cherry amber coloured graduated bead necklace, 20th century, hand knotted and comprising alternating spherical and ovoid beads. 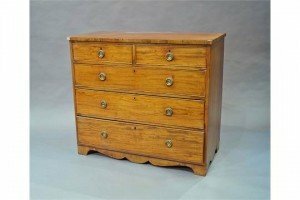 A mahogany chest of drawers, 19th century, with two short and three long graduating drawers, raised on bracket feet. 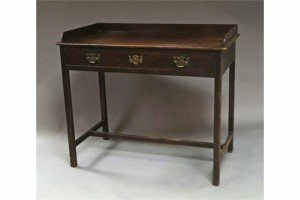 A mahogany rectangular table, 19th century, with gallery back, above frieze drawer, on square legs joined by stretchers. 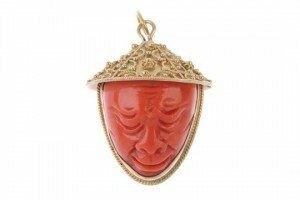 A mid 20th century coral pendant, carved to depict two coral Asian faces, sharing a cannetille cap with rope twist chin strap. 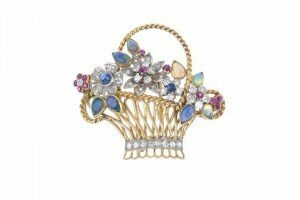 A gem-set and diamond floral brooch. The vari-shape diamond, sapphire, ruby and opal floral bouquet, to the openwork basket with single-cut diamond line detail. Estimated total diamond weight 1.40cts. 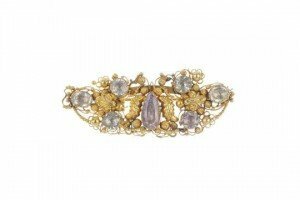 A mid 19th century 18ct gold gem-set foil-back brooch. 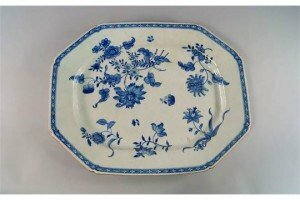 Of openwork design, the pear-shape foil-back pink topaz, with foliate cannetille surround, to the similarly-set beryl and foliate cannetille sides. A Royal Worcester fruit painted shallow plate decorated to the central roundel by Shuck with apples, grapes and daisies, the border edge in blue with gilt detailing, signed, blue printed mark with date code for 1913.